Welcome to the 2018 Kentucky Derby Rankings! 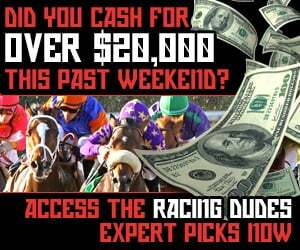 Each week leading up to the race, we will provide our Top 20 Kentucky Derby Prospects, as well as updates with the latest news on each horse. 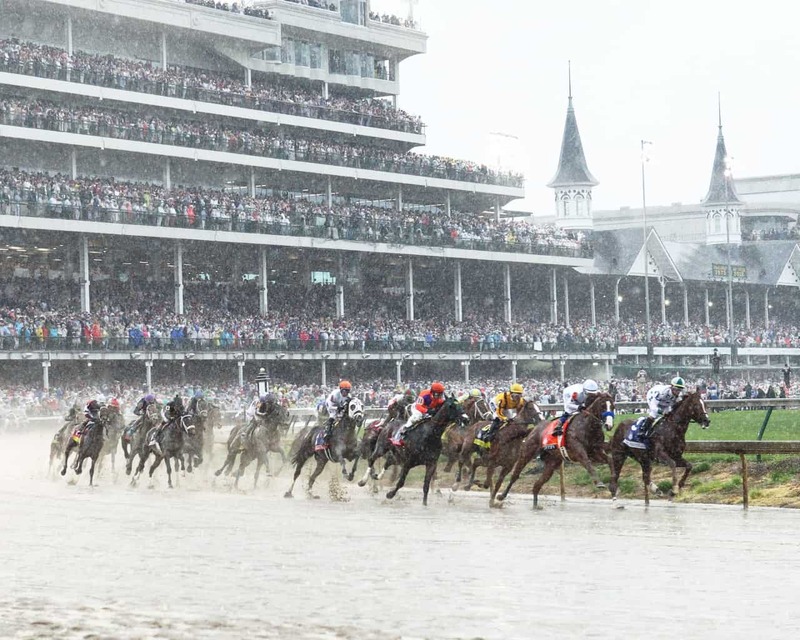 You can also visit our Kentucky Derby page for loads of information including the latest news, rankings, prep race schedules, our Derby Trail Tracker, the Kentucky Derby point standings, and much more! 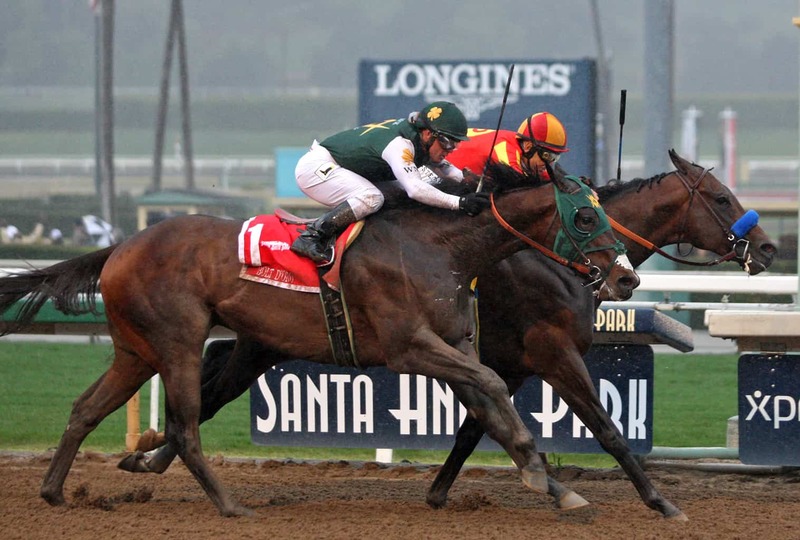 Analysis: A wild weekend at Santa Anita was highlighted by an incredible stretch duel between McKinzie and Bolt d’Oro in the the San Felipe. McKinzie was able to just edge clear of Bolt d’Oro at the wire, but he was later disqualified to second. McKinzie will remain our number horse even with the loss, as the disqualification was questionable. All of the drama aside, McKinzie’s fight was very impressive, as he was headed at the top of the stretch but still battled back when he looked defeated. At this point, these two horses seem to be well clear of the others. 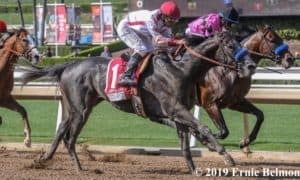 Analysis: He was incredible in his three year old debut in the San Felipe Stakes even though he hit the wire just behind rival McKinzie. The move this horse made on the turn was ultra impressive, and it makes it even more impressive that he ran this strongly off of a layoff. Moving forward he looks to be the real deal as he has carried his great two year form into his three year old season flawlessly. The racing world would love to see our top two horses square off once again as they have lit a fire under the Kentucky Derby prep season. Analysis: This son of Curlin exudes class with runner-up finishes in the Grade 1 FrontRunner Stakes and the Grade 1 Breeders’ Cup Juvenile. 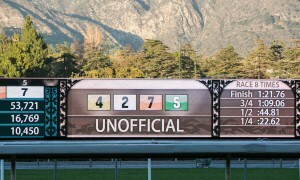 In his most recent start, he crossed the wire first but was disqualified in a very controversial call. That race has already produced FOUR total next-out winners, which flatters Solomini in a big way. He’s on target for the Grade 2 Rebel Stakes at Oaklawn Park this weekend. Analysis: After facing lessor competition at Aqueduct, it was questionable how he would handle the jump up in class, but he passed the test with flying colors, bursting onto the scene with a major score in the Holy Bull. He now has to be considered a serious player and is perhaps Pletcher’s best prospect at the moment. Analysis: Uh oh… the Juvenile champion returned in the Fountain of Youth, but he looked far from a champion. After stalking the pace in perfect position, he was empty when turning for home and finished a distant third. He ran like a horse that was not 100% primed, so perhaps he’ll bounce back in his next start, which will likely be in the Grade 2 Blue Grass Stakes. Analysis: Many may think that he’s ranked too highly after finishing third in his 2018 debut race, but he should improve off of that effort next time out. His trip in the Southwest was less than ideal, and the sloppy track played strongly to horses on the inside. The race was just what he needed going forward, and he’s working out extremely well heading into the Rebel this Saturday. Analysis: He made his 2018 debut in the Sam F. Davis, and while he didn’t run poorly, it was disappointing that he couldn’t pass Flameaway in the stretch and had to settle for second. There’s still reason to be optimistic, but he must improve in his next race, which looks like will come in the Grade 1 Florida Derby. Analysis: The Coach is back in the Derby! Bravazo shipped to Fair Grounds for the Risen Star and pulled off a 21-1 upset over a field loaded with Kentucky Derby prospects. The Awesome Again colt has developed greatly as a 3-year-old. He’s now two-for-two in 2018 and will likely return to Fair Grounds for the Grade 2 Louisiana Derby. Analysis: His fourth-place effort in the Risen Star left a lot to be desired, but it wasn’t enough to remove him from the rankings completely. He seemed a little dull in the race, but he still managed to run well enough to be close to the leaders in the end. Perhaps shipping back and forth multiple times between Fair Grounds and his base in California took its toll on him. Analysis: Right now, I’m trying to stay as grounded as possible with this horse that looks to be an absolute freak of nature. 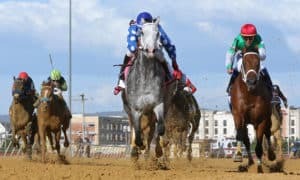 He is two-for-two and has been about as impressive as a horse can be, but he has several factors working against him as far as the Kentucky Derby is concerned. Namely, can he break the Curse of Apollo? Analysis: This is one tough colt. He fought on to a solid third-place finish in the Grade 3 LeComte Stakes two races back, then nearly won the Risen Star, losing by a nose while battling Bravazo all the way down the stretch. His early speed and staying power will make him tough in any race that he enters. Analysis: The Risen Star was a solid first try for him against stakes company. He ran well to finish third while up against a small track bias, and he has a right to improve as he goes forward. At this point, all options are on the table as to where he’ll start next. Analysis: Could this be the Lookin At Lee of 2018? He’s finished second in three straight Kentucky Derby prep races, but he just can’t seem to have things go his way enough to pick up a win. 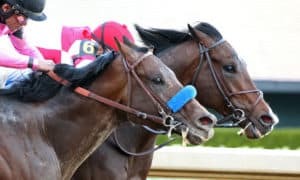 His Southwest effort was another positive start, and he should continue to make an impact along the Kentucky Derby trail, which continues for him this weekend in the Rebel. Analysis: He pulled off a shocking 18-1 upset over champion Good Magic in the Fountain of Youth. The track at Gulfstream Park certainly favored speed, but he reminded me a lot of his sire, Shackleford, by going straight to the front and showing heart to hold on for the victory. He could be an improving horse that’s ready to make some noise this year. 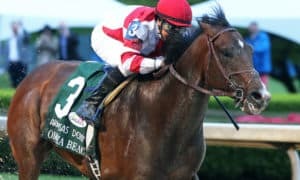 Analysis: The Grade 3 Sam F. Davis Stakes winner backed up that effort with a strong showing in the Tampa Bay Derby. He may not be the strongest horse as far as a win contender, but you have to like how he showed that he could stalk the pace and still come with a nice run in his latest start. Analysis: This son of Distorted Humor is officially into the Kentucky Derby after a shocking upset in the Tampa Bay Derby. The good news is that he should get better in his next start, as his Tampa effort came off of a fairly long layoff. He could move up the rankings if he does indeed improve further. Analysis: He looks like the Always Dreaming of 2018 after picking up two nice victories in a row, including an allowance race at Tampa Bay where he basically schooled behind horses before winning for fun down the stretch. After passing that test with flying colors, he’s now being pointed towards a Derby prep race. However, he’s also racing against the clock, as he has just two starts, none of which came as a 2-year-old. We’ll find out how he does against top-flight company this weekend in the Rebel. Analysis: A tremendous bounce-back race in the Gotham puts him back in contention. That race came at only a mile, though, so we will need to see how he reacts when stretching out in distance before we rank him any higher. 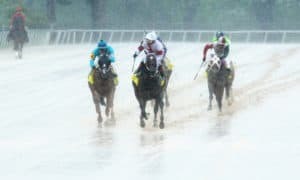 Analysis: The Gotham produced a fairly strange race, as it seemed like several horses did not fire with their best efforts. He will need to rebound in a big way next time out, but there’s reason to believe that he might. Analysis: He got things exactly like he needed them in the Southwest, as the track at Oaklawn was favoring inside speed. Jockey Kent Desormeaux never left the rail, and My Boy Jack simply crushed them in the stretch. If he can repeat that kind of performance on a dry track, then he’ll be dangerous, but he must prove that he can do so first.